Happy Chinese New Year of the Rooster to all! Yes, it’s that time of year again, when we have to make sure our houses are nice and clean and we have a nice, new supply of notes to put into our lai see red pockets. The Year of the Rooster is upon us and we would firstly like to send our big thanks to you, our customers, for helping us to become what we have today. 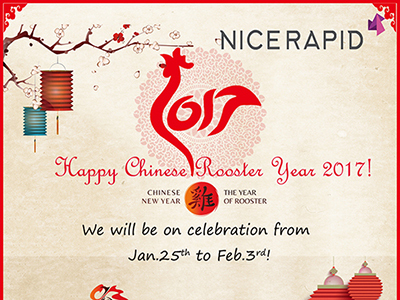 We want to be the most successful Rapid Tooling company in the business and we can only do that by providing an excellent standard of customer service and high quality engineering to our customers, which we endeavour to continue to do in the Year of the Rooster! Due to the approaching Lunar New Year holiday, it has been a busy period, ensuring that our jobs have been completed and the factory is nice and clean before we travel back to our home towns throughout China. Even though many of us are from Guangdong, China is a big place and it can take some time to travel home, due to the sheer number of commuters making the same trip back to see their families. Every year, however, this becomes a little faster and easier, due to China’s investment in the high-speed rail and road networks, keeping our civil engineering cousins busy throughout the year! So, what can we expect from the Year of the Rooster? Well, rooster, or chicken in Chinese, is ‘ji’ in Pinyin which is a similar sounding word to the one meaning ‘tactful’ or ‘lucky’. Often when a word sounds similar to another with a positive meaning, we take this as being a good sign and it will hopefully mean we all have a prosperous and lucky year. For your information, our factory will be closed for the holiday from January 25th 2017 until February 3rd 2017. You are, of course, if you want to discuss some technique issues or need a quote, still welcome to contact with us during that period.